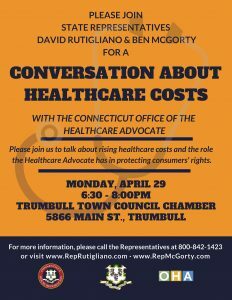 TRUMBULL- State Representatives David Rutigliano (R-123) and Ben McGorty (R-122) are inviting Trumbull constituents to a Forum with the Office of the Healthcare Advocate on ways for residents to potentially save on their healthcare plans. According to both Reps. Rutigliano and McGorty, the goal of the forum is to highlight the Office of Healthcare Advocate as an important public resource for anyone that has healthcare coverage questions or concerns or might have an appeal or a particular grievance regarding their health plan for Trumbull residents. If residents are unable to attend the healthcare forum you can reach them by calling 1-800-842-1423 or email their offices’ at Dave.Rutigliano@housegop.ct.gov and Ben.McGorty@housegop.ct.gov.